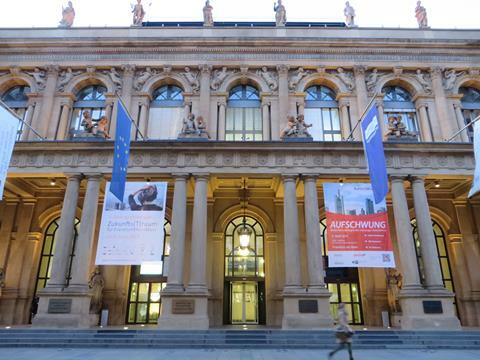 Germany is the fourth richest country in the world and the most populous and therefore influential country in the European Union. It was split into East and West from the end of the second world war until 1989 when the country was reunified. 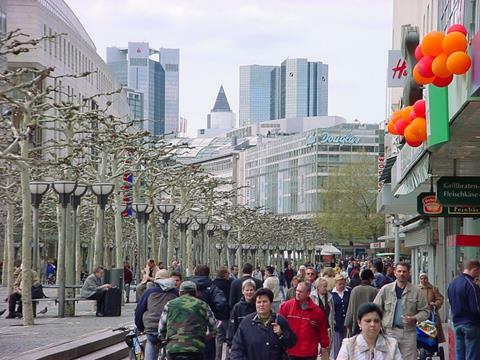 Much of the country was devestated after the war, but the skilled and industrious people of Germany rebuilt their country into the world-class economy it is today. I have not travelled much at all in the Germanic world, my family have no connections with the country and it's not an area we ever went to on holiday when I was young. 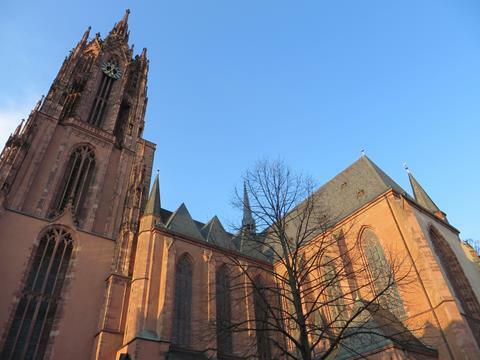 However when I had a six-hour stopover in Frankfurt Am-Main on my way back home from Arizona, I felt it was the perfect opportunity to see a little bit of the place, however brief. Almost exactly ten years later, I found myself in the same position on the way home from Kiev. I look forward to exploring Germany beyond Frankfurt at some point in the future! I was in the city each time for just long enough to have lunch, explore a little, and do a spot of shopping. My somewhat limited German didn't cause me much trouble as the majority of people are good English speakers. The Frankfurt skyline as viewed from a footbridge spanning the River Main. The city is built just before the Main's confluence with the mighty Rhine, on its way to Rotterdam. I like this view of the new rising above the old. 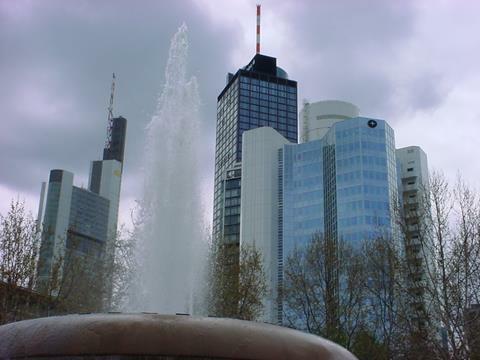 Frankfurt city centre has a modern skyline, fueled by the city's status as the economic centre of continental Europe. It has been called "the most American city outside of America". This is what I gather to be the main shopping street in Frankfurt, which although busy wasn't frantic like Glasgow's Buchanan Street on a Saturday. I think the street is called Zeil. Frankfurter Dom, the cathedral of Frankfurt, had fortunately been long since done-up when I stopped by in 2014, as it had been sheeted over during my previous visit ten years earlier. Like much of the old town, it was significantly rebuilt in the years after the war. It was clear whilst wandering around that everything is fairly modern. R�merberg square by the cathedral where these traditional old buildings stand was one of the few areas I found which was more than 50 years old, although as I later discovered, only in appearance. 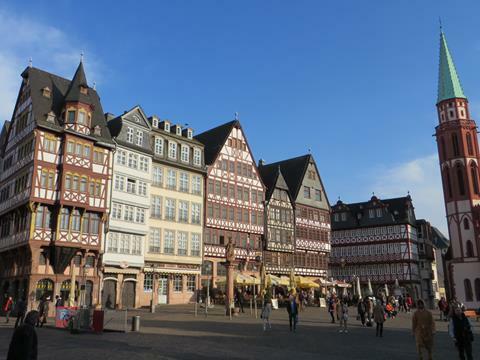 Frankfurt was all but flattened during the war, and these buildings were reconstructed in the 1980s. 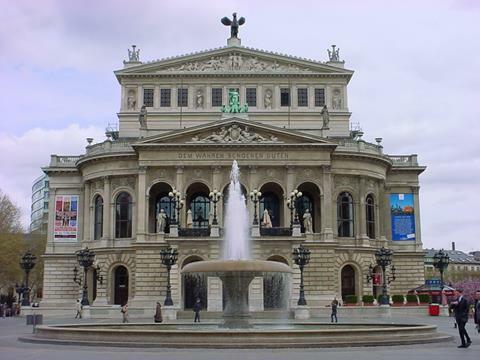 The Alte Oper (Old Opera House) in Frankfurt was built in the 19th century, and after standing as a ruin for 40 years was reconstructed at great expense during the boom of the eighties. The motif above the entrance says "Dem Wahren Schoenen Guten" which means "To truth, beauty and good". 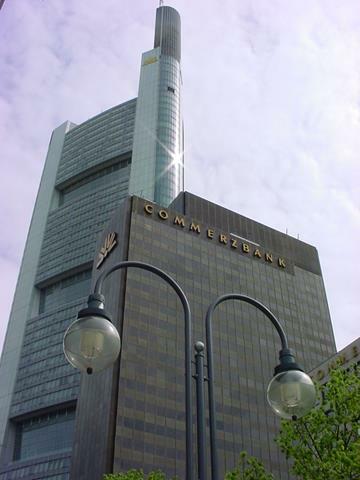 The Commerzbank building in central Frankfurt was completed in 1997 and became the tallest office building in Europe at 300 metres. 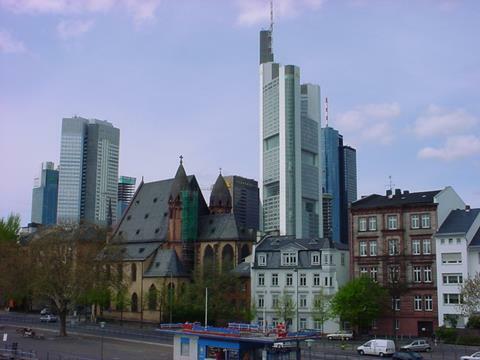 Frankfurt's sudden appearance as a financial centre after the war was aided by Berlin's division and inability to compete. 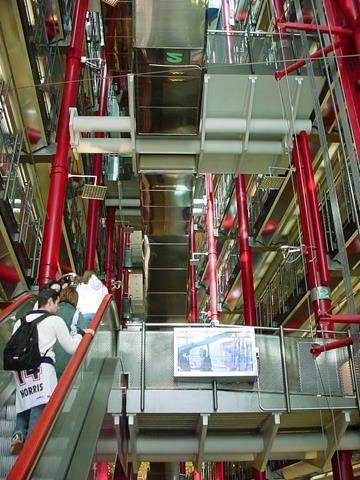 These twin towers are known locally as "credit and debit", and exhibit the fully mirrored glass curtain walling common in large commercial buildings of the eighties. 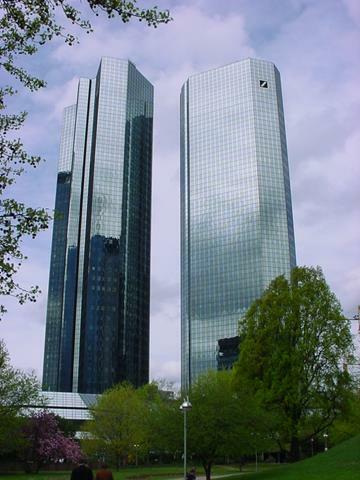 They are both occupied by Deutsche Bank. 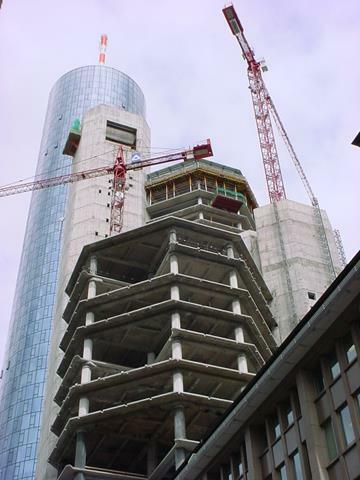 There is a lot of development going on in Frankfurt, here Garden Tower is actually being stripped down to the concrete core and entirely refitted, having been originally built in the seventies. If I remember rightly then this shopping centre is called the Zeil Galerie and is on Zeil, the main shopping street. 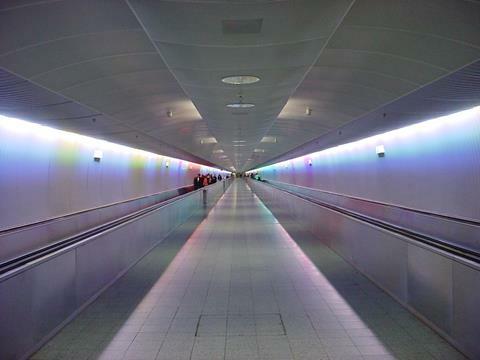 It reminded me a bit of the Pompidou Centre in Paris. I liked this angle on the Commerzbank, neatly in line with the name of my location, upon emerging from the supremely complex and spaghetti-like underground transport network at Hauptwache. 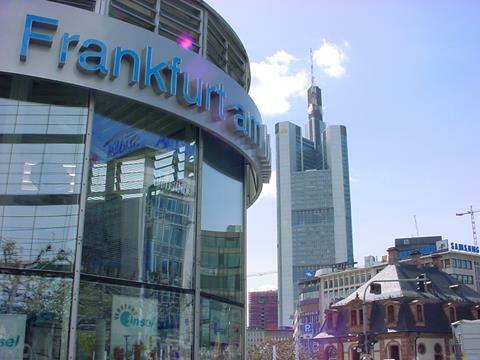 Frankfurt is Germany's economic centre, this is the Frankfurter Borse, the stock exchange, which accounts for the handling of a large portion of the overall European market. 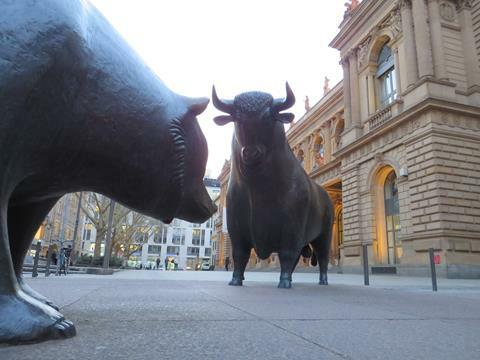 A bull and a bear face off outside the stock exchange, representing the upward and downward markets. Wall Street famously sports a bull statue, as does my old home Tanggu in China. 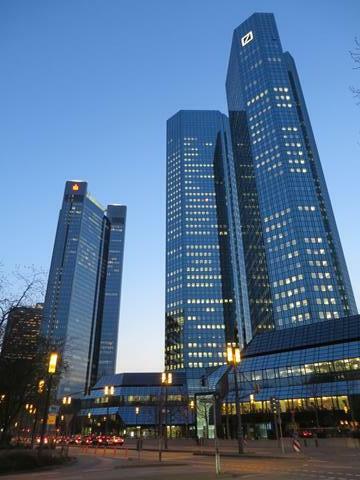 Night falls on the glittering Frankfurt skyline, with the credit and debit towers opposite the Alte Oper.